With 18 candidates, including Donald Trump, the Republican nominations look like pure anarchy. But, there are a few metrics that line up the top candidates with the known dates for political drama: a series of debates starting August 6 on Fox News (5 debates in 2015, including Colorado on October 28) and the caucus primary season beginning February in Iowa, with super delegate events in March. 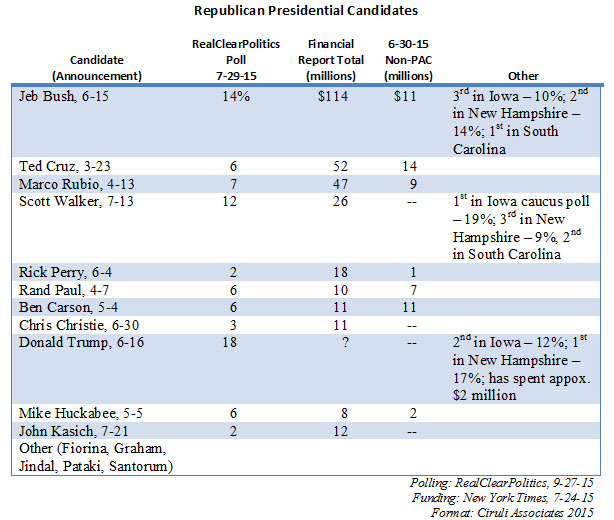 As of July 29, the following are the polls and money as we know them for the top candidates. 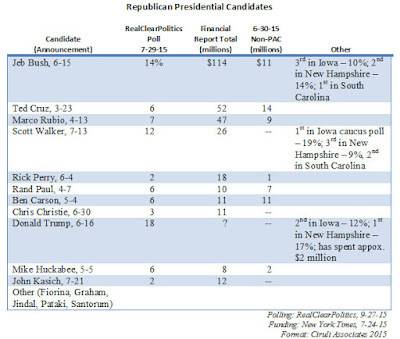 Jeb Bush leads the money race and is tied with Scott Walker in the polls. However, the current leader in polling is Donald Trump. Ted Cruz and Marco Rubio have substantial poll numbers and war chests that can propel them into the March primaries and caucuses. Rick Perry is at the bottom of the pack, essentially tied with John Kasich, who also has 2 percent and $12 million vs. Perry’s $18 million. It is estimated that it will require $60 million to mount a sufficient media and field campaign to get into the mid-March delegate selections. Washington D.C., including the party’s own leadership. In fact, the more Trump attacks the leadership, the more intensely they support him. Many Republican voters are at the moment only interested in shaking up the system, and Trump is their candidate. 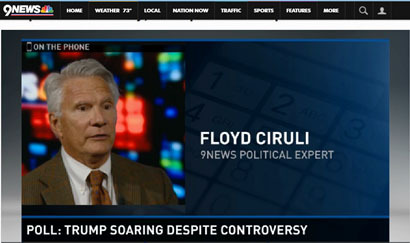 9-News Political Expert Floyd Ciruli says Trump’s controversial comments may actually be the reason he’s gained so much support among Republican voters. The latest round of polls show Trump ahead of Jeb Bush and Scott Walker after the attacks on Senator McCain. He has also surged to second place in Iowa and New Hampshire. One irony the latest Quinnipiac Colorado poll shows is that the more Hillary Clinton plays the gender card, and it is now one of her main strategies, she is alienating men more than convincing women. Possibly that is just a Colorado phenomenon because that was the reaction to the Democrats’ gender war strategy observed in the 2014 Udall senate race in Colorado. The more Mark Udall talked about war on women issues, the more he lost men. Polls in October 2014 repeatedly showed a negative gender gap, with him losing more men than gaining women. The Quinnipiac poll gathered national attention as Clinton ran behind three top republican contenders. In Colorado, Jeb Bush beat Clinton by 5 points. He was the weakest among the candidates tested. Scott Walker beat Clinton by 9 percentage points. But their face-off shows the same gender patterns. Clinton wins women by 11 percent and loses men by 28 percent. 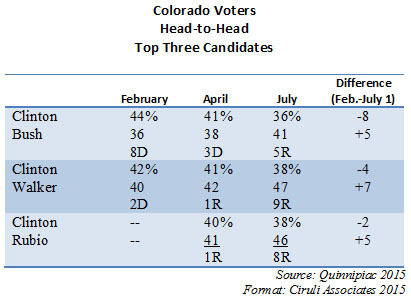 As affirmed by the Quinnipiac Colorado poll, Hillary Clinton is not having a good summer, and it’s mostly all about her and her party, not some external force, such as a “vast rightwing conspiracy.” In fact, Republicans are more likely to be criticizing Donald Trump than Clinton. Since Clinton announced on April 12, she has suffered a steady erosion of support. 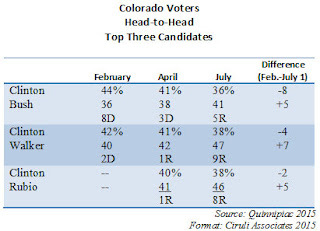 Although she is still ahead of the Republican field nationally, the latest Quinnipiac poll (July 20) shows her behind the three top Republicans in Colorado. Brandon Rittiman and I discussed the latest Quinnipiac Colorado Poll showing Hillary Clinton losing to the top Republican candidates. 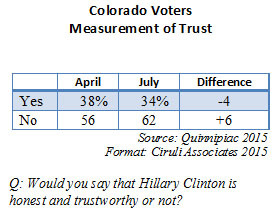 There have been three Quinnipiac polls in Colorado this year and the trend lines have not been positive for Clinton. Her favorability and trust numbers have dropped. Clinton’s favorability rating dropped 9 points since February. She has more people who view her unfavorably as favorably. Clinton’s e-mail and other troubles earlier in the year have merged into a common theme that she is untrustworthy, which when placed in the context of the Bill and Hillary White House years, is a memory that is sapping much of the enthusiasm for her candidacy. On the issue of trust, Clinton slid 4 points since April after her informal (video) entrance into the race (the question was not asked in February). The positive-to-negative rating was abysmal in April and is now worse. Nearly twice as many people say they don’t trust her as do. The more Hillary Clinton campaigns, the worse she does. Partially, it’s a reflection of the division in the Democratic Party, with its deep liberal base vs. nearly all the rest of the party. Bernie Sanders is receiving their attention. The poll compared three of the top Republican candidates in a head-to-head with Clinton. Her losses ranged from 5 points with Jeb Bush to 9 points against Scott Walker. The loss in a swing state like Colorado was national news and led to considerable speculations as to the state of her campaign. 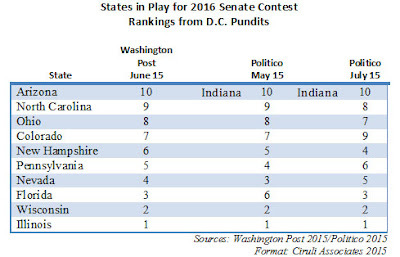 As the chart shows, Governor Walker moved up 7 points since February and Clinton down 4. Walker carried the independents in this poll by 11 points. Bush’s most significant problem was only attracting 82 percent of Republican identifiers whereas Walker carried 90 percent and Rubio 89 percent. In the current RealClearPolitics.com national head-to-head report, she beats Bush by 6 points, Walker by 11 and Rubio by 8. And in the Republican nomination lineup, Donald Trump is now the frontrunner with 18 points, Bush second with 13, Walker 12 and Rubio fourth at 7 points. It is not clear that this is a one day story or this poll reinforces a trend that will begin to show up in national polls. Needless to say, the Administration went into hyper drive to characterize the General’s views as his own. Secretary of State Kerry managed to break from the Iran negotiations long enough to state he did not share the assessment. Obviously, part of Kerry’s urgency to disavow the view is that he needed Russia’s cooperation on the Iran-nuclear agreement. Kerry and the White House stated that those views do not reflect the “consensus analysis of the President’s national security team.” Hence, it’s probably correct to say that dealing with the Russian threat will be an issue in the presidential election and a primary responsibility of the next administration. Dunford also disagreed with the Administration’s views on providing weapons to the Ukraine government and armed forces. Ash Carter, the Secretary of Defense, shared Dunford’s view during his confirmation hearing, and he still supports arming Ukraine. A major European Pew Research poll released in June at the time of the last G-7 Summit that featured discussion of President Putin and the Ukraine crisis shows that one of the most significant challenges for the next American administration is reviving support for NATO and joint action against an aggressor, like Russia, especially among the German public. 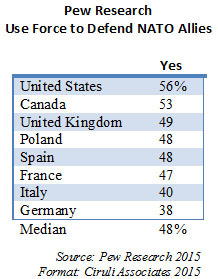 When asked if they would support their country using force to defend a NATO ally, only 48 percent of Western European citizens said “yes” and only 38 percent of Germans. 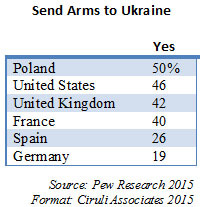 Also, there is little appetite in Europe for defending or arming Ukraine again, especially in Germany. CNN: Joint Chiefs nominee: Russia greatest threat to U.S. The Denver Post is right – digital and mobile technology is taking over personal communication and internet connectivity for work, school and news consumption. 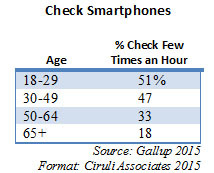 The Post’s recent employee memo on digital reorganization cited that more than half of its readers access on a mobile devices and the percentage is higher for breaking news and for Millennials. 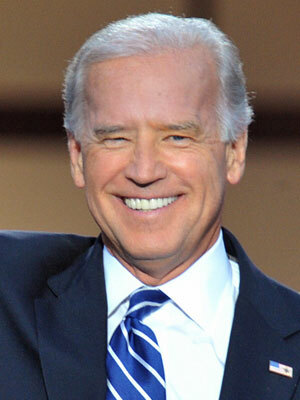 Joe Biden will not be President unless Hillary Clinton has a near fatal accident, political or otherwise. In Brandon’s tweet: “In case Hillary Clinton catches fire, break glass and remove Joe Biden.” 9KUSA Brandon Rittiman covered the Biden Colorado visit Tuesday and his question is why has Biden not endorsed Clinton? Vice presidents are typically first in line to succeed their presidents. After several unsuccessful tries, he still wants to be president. Biden had the poor fortune to be serving during the final moment of the Clinton era. Hillary Clinton’s razor thin loss to Barack Obama in 2008 gave her preferred spot for 2016, if she wanted it. Was there any doubt after she took the Secretary of State position that her ambition continued? Biden, due to his failed presidential attempts, age – he’d be 74 taking office – and history of gaffs, was quickly relegated to an also-ran positon. If he tried to run, how would Biden distinguish himself from Clinton? They both worked for Obama and are moderate liberal Democrat. He has no ideological base in the left (Elizabeth Warren) of the party or the populist right (Jim Webb). And, although he’s genuine and charming, a charismatic personality he’s not. Although Biden was pushed aside, he polled in weak second place behind Clinton in the early polls as the party’s most logical, if unenthusiastic, choice. Biden’s only hope was Clinton stumbling in the early going. And while her campaign is hardly soaring, the alternatives (Sanders, O’Malley) are not really threatening as they look unready for a general election or for the White House. The Democratic Party may have a far left, but its main motivation is holding the presidency since they are in a weak second place position in Congress and in the states. The Party has made its bet and it’s Clinton. Sorry Joe. The Obama presidency overlaps the significant shift in U.S. opinion to the left on a host of topics. The Gallup Poll recorded after the President’s speech and the violence in South Carolina that a majority of Democrats (58%) now see the Confederate flag as a racist symbol. Among Democrats, there was a 16 point drop in people who saw the flag as a symbol of Southern pride and an 18 point increase since 2000 in those who see it as a symbol of racism. Republicans have not significantly changed their views. Also, it was the rapid shift among Democrats that fueled the recent surge in support for gay rights, although, there was some movement among all partisans. 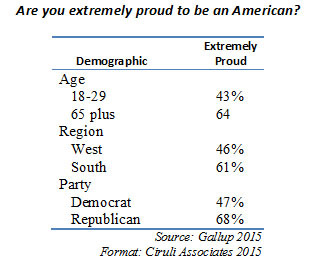 Today, only 27 percent of Democrats believe it’s right for southern states to display the flag. This fight is only beginning, and it will be one of President Obama’s legacies, mostly due to his use of the pulpit. I was going to describe Lynn as the Dean of the Delegation, the term used to describe the lead political reporter in Washington D.C. who everyone looked to, to offer the first interpretation of political events. They were usually with the Post or Times. David Broder and Dan Batz come to mind. 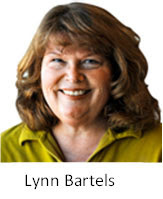 There really isn’t much of a “delegation” of political reporters in Denver but what there is of it, Lynn Bartels is the dean. But she would probably prefer to be the Mother of Dragons – the job is definitely edgy. We will miss her. Bartels is Colorado’s most influential and respected political reporter. As a journalist, Lynn saw her responsibility to her readers as a part of public service. She contributed to the accountability and transparency of our system. But a branch of state government that is responsible for election integrity is benefited and, compared to the newspaper business, there is more job security. Denver, Colorado’s largest city and county, holds elections in May of odd-number years. The goal was to separate the elections from partisan politics. That mostly happened, but it also isolated it from voter awareness. Without a significant mayoral contest, the election and candidates disappear. As the Denver Post’s Jon Murray records the seven new councilpersons are the largest changeover since 2003 when a new mayor, John Hickenlooper, joined many members of this year’s retiring council. These twelve years have been busy with a major recession and budget cuts and a host of contentious issues (homeless ban, police and sheriff settlements), but Denver mayors and council have mostly worked together on big issues and received voter support for major initiatives, such as a new justice center, the half-billion dollar bond package in 2007 and the recent TABOR override. City government and the business community have had a close working relationship for several decades. It has served Denver well. Denver has continued to grow in terms of jobs and sales tax revenue because, in spite of its left orientation on social issues, it tends to be moderate on tax, regulations and unionization. But the new members have varied backgrounds, and political analyst Floyd Ciruli says Denver's council has tended to strike a moderate chord as a whole. He sees the councils of the past three terms as typically defined by cooperation, between the members and with mayors — John Hickenlooper and, now, Michael Hancock. 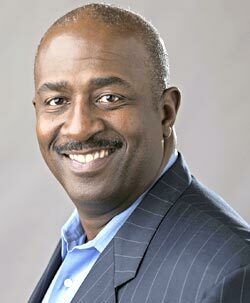 The latter is a former councilman who served with several of the outgoing members. "There were times when the Denver City Council and the mayors would argue a great deal," Ciruli said, with mayors holding the upper hand in Denver's system. "And that really has not characterized, in my opinion, these 12 years." Michael Bennet has had a good summer. Republicans have not recruited a strong senate candidate or even identified one as of the middle of July and the party is dealing with its own internal disputes. President Obama has had an exceptional month (Gallup, Fox News and Economist/YouGov have him at or about 50% approval) and the Republican presidential field has been upended by Donald Trump, who is now running first or second in the three recent national polls (USA Today/Suffolk: Trump 17%, Bush 14%; CNN/ORC: Trump 12%, Bush 19%; Fox News: Trump 11%, Bush 15%). But, Bennet is hardly home free. It’s 15 months until the election and Cory Gardner, the Republican 2014 winner, did not enter the 2014 senate race until February 2014. Most importantly, in recent years the alignment of the presidential and senate elections in swing states has grown. Today, more than 80 percent of voters are selecting matching parties for president and senate. Of course, if the Republicans have a weak and poorly funded candidate, it could well ensure a loss, regardless of how Ms. Clinton does in Colorado, but if the state remains competitive with only a few points between the respective presidential nominees, Bennet is likely to be in a very close race, even given the advantages he appears to be building. Due to the Republican Party’s struggles in Colorado, Politico has just lowered Bennet’s vulnerability to 9th from their previous 7th. 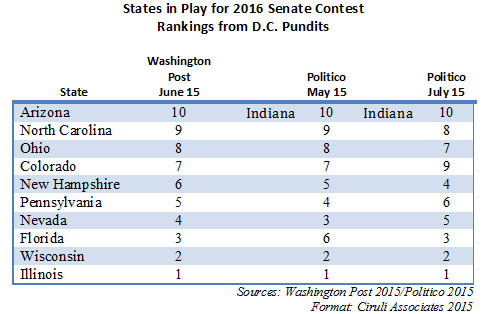 In its latest rating, Politico only kept Colorado in its top ten list due to the expected competitive nature of the presidential race and because no other senate race appears more competitive (note Politico ranks Arizona 12th). Congress and not face the hostility health care still faces from the American people is the Administration’s other negotiating goal. Hence, getting a deal that appears to meet the basic expectations, has the support of the negotiating powers and can hold most of the foreign policy media establishment is essential for public opinion and Congress. As a backup, the Administration is activating its liberal support groups to ensure that if a veto is needed, it can’t be overridden. There is more support to stop Iran now than after an agreement. Enforcing an agreement will be a challenge for public opinion and the next administration. There is significant skepticism that the agreement will stop a determined Iran from getting a bomb, improve the life of its citizens or behave better toward its neighbors. This president has sacrificed much of the U.S.’s strategic flexibility and friendship with Middle Eastern allies to achieve this agreement. It may be an Obama/Kerry legacy, but it remains to be seen if it is of long-term U.S. or Middle East strategic benefit. Democrats will not win control of the U.S. House in 2016, but they have a very good chance to pick up Colorado’s Sixth Congressional seat. An expected jump of more than 70,000 voters from 2014 will be State Senator Morgan Carroll’s greatest asset. 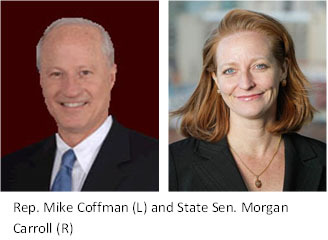 Barack Obama won the district by five points in 2012 compared to Mike Coffman, who barely survived a challenge from an underfinanced, inexperienced Democratic candidate. 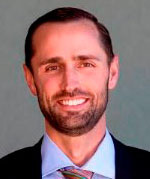 Morgan Carroll was the Democratic Senate leader for a short time, and as opposed to the Democrats’ 2014 candidate, is a local elected official. If Hillary Clinton runs as expected, a strong race, accompanied by a well-funded Michael Bennet seeking re-election, the Democratic ticket should be a significant boost for Carroll in the Sixth District. As a woman in a targeted seat, she should have nearly unlimited funding. And as a woman running with Clinton, it could be a good year for women candidates. Carroll will, of course, have some challenges. She is very liberal and was associated with the controversial and recalled senate Democrats of 2013. She was in charge when her party lost the Senate in 2014. And, Coffman has established himself as an indefatigable and talented campaigner. This race will start near or at the top of the national list for a competitive seat, and it will be Minority Leader Nancy Pelosi’s last chance (my fourth consecutive bi-annual prediction she will retire). A new poll of Denver voters by marijuana advocates shows a public with little enthusiasm for the spread of marijuana consumption to bars and clubs. Although advocates emphasize that total support for the initiative was 56 percent, in fact, more voters strongly oppose the initiative (31%) than strongly support it (20%). Voter passion is opposed to the initiative. Also note the 56 percent support is much weaker than the 66 percent recreational marijuana passed by in Denver in 2012. The marijuana industry may find out Denver voters are cautious toward expanding the city’s reputation as a center for sales and consumption. It has been a strategy of the European left, Prime Minister Tsipras and his government to describe Germany and its leadership, especially Chancellor Angela Merkel and Finance Minister Wolfgang Schäuble, as draconian architects of a fourth Reich with its boot on Greece and southern Europe. Unfortunately for their strategy, public opinion in Europe does not agree. In fact, a poll of a few years ago (Pew Research 2012) asking Europeans to rate countries as hardworking and honest described the Greeks as the least hardworking and Germany the most hardworking and least corrupt. 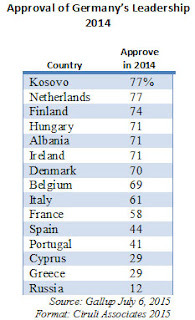 Italy was judged as the most corrupt country. 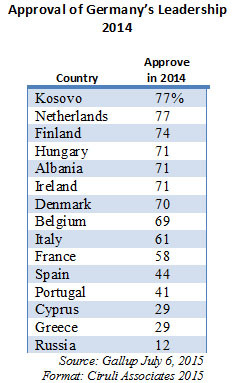 One exception was the Greeks who thought their own country was the most corrupt. A recent Gallup poll (July 6, 2015) shows that German leadership is highly popular in the European Union. Worldwide, Merkel is as popular as Barack Obama (41% Germany, 45% U.S. approve or disapprove of the job performance of the leadership of….). All of Western Europe is supportive of the fight against ISIS, with our most reluctant partner, Germany, at 62 percent. Neither the Ukraine nor Russia are supportive. The Middle East countries adjoined to ISIS operational territory are supportive of U.S. action against it. Latin America countries are not supportive, with the exception of Brazil, and even its support is modest. Greeks Say No – 61%; Late Polls Say 50-50? The left wing Syriza government wins a no vote in a snap election Sunday, July 5. Final results were 61 percent to 39 percent. A total of 6.1 million votes, a little over half the electorate. Most Greek polls predicted a close election, with a slight lead for the ‘no” vote, including those on July 4 and conducted in late June. But the series of polls just as news coverage became most intense from June 30 to July 3 showed the “yes” position in the lead within the margin of error, with 10 percent or more undecided. Reporting covered it as razor close. The polling in this election will no doubt be added to the growing list of recent polling mishaps. FiveThirtyEight: The Polls Were Bad in Greece. The Conventional Wisdom Was Worse. The millions of Americans who displayed a flag, watched a parade and fireworks were participating in one of America’s leading characteristics – patriotism. Pew Research reported in their 25-year values comparison (1987 to 2012) that, in spite of increased partisan polarization, the percentage of Americans claiming to be very “patriotic” has remained consistently high – 89% in 2012 (never below 85% in over 25 years). 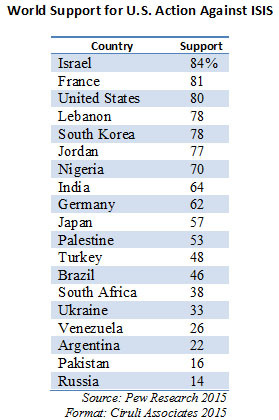 In a 2006 study from the National Opinion Research Center (NORC) authored by Tom Smith, Director of the General Social Survey, America was the leading country out of 33 in pride of national accomplishments and second in national pride. National pride questions: “I would rather be a citizen of my country than any other country in the world,” and “Generally speaking, my country is a better country than most countries.” National pride in accomplishments, such as in science and technology, the arts, sports and political influence in the world. But in international and national studies, there are differences over time and among demographic groups. Nations recently experiencing terrorist attacks or that are in ascendance or decline based on their economic conditions and globalization can have significant variations in national pride. 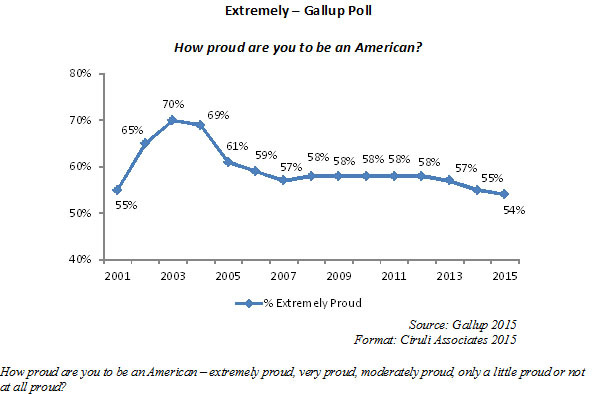 Among Americans, 81 percent say they are either “extremely proud” (54%) or “very proud” (27%) to be an American. 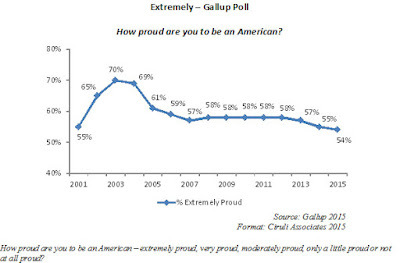 There is variation in the percentage saying they are “extremely proud,” with the height of 70 percent after the 9/11 terrorist attack declining to a more common mid-50 percent level from 2007 through today. Although it won’t happen under this president, American troops will be back in Iraq and Syria fighting ISIS if public opinion is the guide. The latest NBC News/Wall Street Journal poll indicates 60 percent of the public support sending troops for as “long as it takes” (28%) or “for a short period to allow the Iraqi Army to take over” (32%). U.S. public opinion on commitments to war and military action must be gauged cautiously. Question wording, response categories and question order can have a major influence on the results. So can the first sign of blood. As the same NBC News/WSJ poll demonstrated, when support for combat troops to fight ISIS is put in a favorability question for presidential candidates, only 52 percent claim they would be more favorably disposed toward the candidate (and only 24% “much more favorable”) if they support deploying combat troops. And, a recent Fox News poll (6-2-15) shows when a “boots on the ground” question is asked with a range of options for fighting ISIS, drones (71% favor) and more airstrikes (68% favor) are much more popular than “sending a limited number of U.S. ground troops to Iraq and Syria” (51% favor) or “sending a significant number of U.S. troops to Iraq and Syria” (37% favor). But the same Fox News poll shows there is more than enough survey data to indicate that the ISIS-Middle East policy is in flux and likely to get tougher. 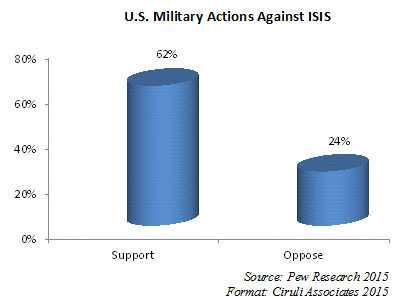 The public believes ISIS is a significant threat. Republicans especially want action and the administration is seen as disengaged and uncommitted. President Obama’s Middle East orientation is shaped by his commitment to end the American military involvement. His September 2014 action to deal with ISIS has been limited to air power, training and equipment, although the rhetoric has been aggressive – “degrade and destroy.” Objective assessments indicate ISIS continues to hold ground and expand its terror into Europe and North Africa. Reluctantly agreeing, the administration has made only modest shifts, most recently adding 500 more trainers. Republican presidential candidates universally support additional resources to defeat ISIS and most support “boots on the ground.” They are in alignment with Republican partisans, whom 80 percent support and 51 percent are prepared for a long commitment. Obama’s Foreign Policy Era Coming to an End? Incentives using water we have already: recycled, rain and grey water. If Colorado wants to avoid California’s panicked drought reaction, we should use this opportunity and years of hard work to take some real action. See The Colorado Independent: Waiting for Chapter 10: What’s the plan in the state water plan? paper’s transition from a “newspaper” to digital platform in which paper still has a role, but not much. Describing the new working groups and the skill sets that will have to be developed is the work of a Pulitzer Prize itself. It’s hard to imagine the region without a “paper,” but we are headed toward a “platform.” Hopefully, it can provide all the community benefits we have received from 150 years of great newspapers. We were diminished as a community by the loss of the Rocky Mountain News, a diminished and hard to find Post will be an even greater loss. 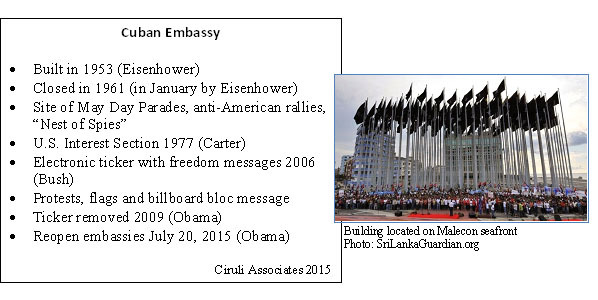 He may not make it this year, but if President Obama visits Cuba next year, he can visit a functioning U.S. Embassy. The U.S. and Cuba agreed to reestablish their embassies on July 20, closed since 1961. The latest Chicago Council on Global Affairs survey affirms earlier U.S. surveys that the public favors ending the embargo with Cuba (67%). But only 53 percent believe the change will “improve political freedoms in Cuba” and only 39 percent of Republicans believe it. Cubans in the recent island poll agree with that sentiment and the Washington Post editorial page recently criticized Obama’s eagerness to visit Havana in the face of what they described as increased political repression on the island as rapprochement proceeds. But allowing U.S. citizens to travel to the island and Cubans to travel to America are the most popular policy changes among both publics. Assuming citizen power may have more influence on changing people’s lives and views than government-to-government actions let the travel begin. June may have been the most successful month in Barack Obama’s presidency. The Supreme Court saved his signature legislative accomplishment for a second time in three years with a ruling concerning state-level subsidies (June 2012 ACA mandate ruled constitutional as part of taxing power). The Court also expanded gay rights by finding a constitutional right to marry. Republicans gave the President fastback trade legislation for eleven Asian-Pacific nations. Finally, on June 30, Obama announced an exchange of embassies’ agreement with Cuba and a new climate pact with Brazil (more of a soft pledge from President Rousseff to set a target by the end of the year). Although the month brought mixed news on the economy, the public was more comfortable with Obama’s handling of it. And, of course, this president was able to highlight his commitment to improve race relations and his rhetorical if not music skills with a powerful eulogy in South Carolina and vigorous rendition of Amazing Grace. In an early review of the President’s month, CNN showed his approval rating above 50 percent for the first time since his re-election and second inaugural. It had been a difficult two years since those heady days in early 2013, culminating in the 2014 election debacle. But Obama appears to have momentum. The June 29 reading reflects a five point jump since the end of May (45%, May 31, 2015). He also improved his standing with the public on handling the economy (52%, up from the mid to lower 40% since 2009, the start of the Great Recession). Although CNN numbers were the highest in the RealClearPolitics compilation of recent polls, it highlights the President’s powerful month. (The last time Obama’s CNN approval was above 50% was in May 2013 – 53%, inaugural 55%, 2012 re-election 52%). The U.S. Supreme Court ruling overturning gay marriage bans as unconstitutional is the capstone of an extraordinary rise in public support, including among Coloradans. Nationally, support for gay marriage moved from 27 percent in 1996, to 37 percent at the beginning of the new century, to a majority for the first time in 2011. In April 2012, a PPP poll showed 53 percent of Colorado voters supported gay marriage, up from 47 percent in late 2011. Today, Gallup reports 60 percent of the nation favors legalizing gay marriage (57% in latest Pew poll). Colorado has had a special and controversial relationship with gay rights. A high profile battle began in 1992 when social and religious conservatives initiated and helped pass by 53 percent a prohibition on state and local government allowing protections for gays in areas such as in housing and employment. It lead to a court fight, ending four years later in the Supreme Court where it was ruled unconstitutional in Romer v. Evans in an opinion written by Justice Anthony Kennedy. In spite of that legal progress, Colorado voters waited another 10 years (2006) before joining many other states to approve a statewide constitutional ban on gay marriage. That same year they also rejected a referred statute legalizing civil unions. But by 2012, with gay marriage gaining public opinion support and President Obama announcing his own evolution, the issue gained powerful political momentum. 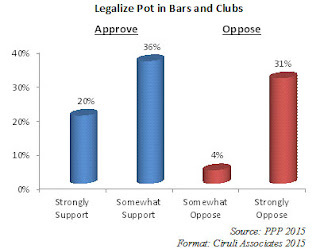 Advocates pushed state courts and legislatures toward legalization. Colorado’s Democratic-controlled legislature passed civil unions in its 2013 session. Finally, federal courts ruled the 2006 ban unconstitutional in 2014, which was upheld in last week’s Supreme Court ruling. Twenty-three years elapsed in Colorado from a ban of legal protection to a constitutional right, and from a narrow minority position to a public opinion majority. Amazing.